Tusks of elephants at the Karachi Safari Park are being deliberately cut off. Governmental inquiries however following reports that tusks had been cut off from live animals housed in a Karachi Metropolitan Corporation facility and following notice taken by the chairman of the Standing Committee on Government Assurances (Prime Minister Office) found the tusks to be broken but the larger portion remaining intact. The KMC inquiry report prepared and signed by its own vets also showed similar findings. “Both the tusks of the older elephant (female) were found traumatically broken. There was, however, no sign of cuts as such, as roots and pulp of teeth were found intact. Hence, the allegation of tusk theft doesn’t appear to be correct,” the report says. Interviews with staff showed that two pieces of elephant tusks measuring 5.2 grams and 8 grams were found by keepers and were deposited with the zoo administration, it adds. “Elephant may damage their tusks in fight and during play. 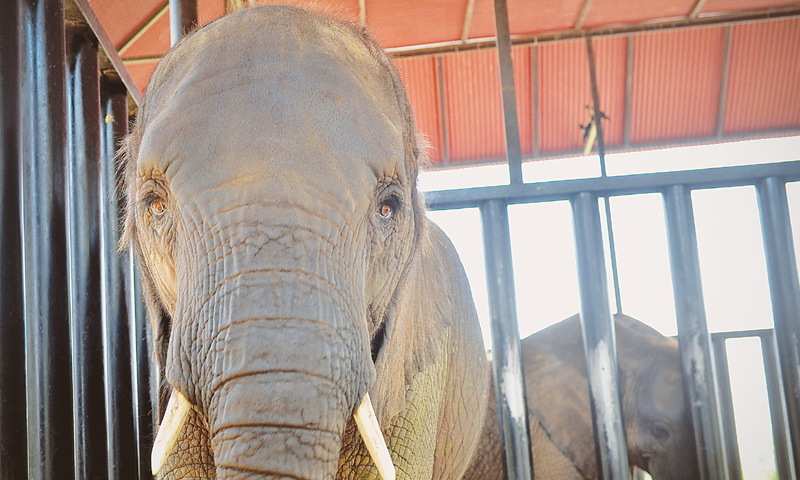 They could also get broken by their excessive rubbing on solid surfaces and also due to captivity stress disorders that have an impact on elephants,” it says. Tusks are not just defense tools for elephants but they help them in digging and stripping bark and moving things out of the way. They never stop growing. As if this was not enough, five pelicans have gone ‘missing’ recently at the Safari Park despite the fact that all pelicans kept at the facility were pinioned to prevent their flight. Animal theft at the Safari Park is common at the place, The official in charge of the facility said that an inquiry into the issue had been ordered as if this is going to solve the mysterious loss. 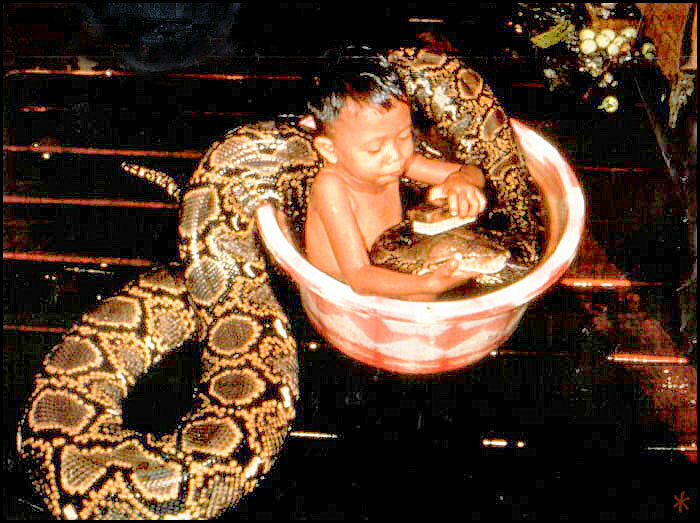 In 2014, two pythons — a 17-foot-long reticulated python and a 12-foot-long albino reticulated python — went ‘missing’ at Safari Park where they had been brought from the zoo for a pet show on Eid. The zoo administration declared them dead only after keeping a mysterious silence over the issue for three months. Both the zoo and Safari are managed by the Karachi Metropolitan Corporation. Interestingly, the recently appointed official in charge of Safari Park Mugheera Qadri claimed that he had no report about some pelicans being missing. “In fact I am thankful to you for bringing this issue to my knowledge,” he said, adding that an inquiry had been ordered to ascertain the facts. Mr Qadri said three pelicans had recently been separated from the flock for pinioning. The surgical procedure was required every two months as feathers were grown fast, he explained. “I think the birds are being kept in a clinic,” he said when asked about the place where they were being kept for pinioning. Safari Park, according to the sources, had no facility for keeping animals for medical treatment. “I am not sure about the exact species the birds belong to but I can tell you after asking the staff concerned,” he said while responding to a question about the pelican species. Safari Park’s collection of pelicans rose to 21 last winter after five of them attracted to its lake were captured by its staff. Previously, the park had received a donation of 16 birds — 10 dalmatian pelicans and six rosy pelicans. All the 21 birds later were pinioned and released into the lake. While five of them died during the past one year, the park is left with only 11 pelicans at present, raising questions about at least five other pelicans which are said to be missing. 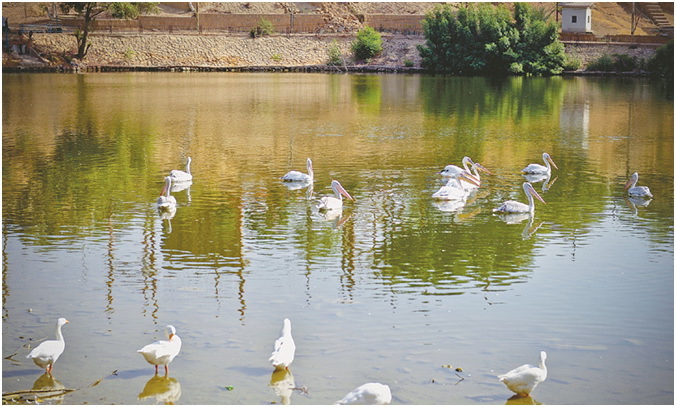 The issue of donation of 16 pelicans to Safari Park had also stirred a controversy, for pelicans are protected under the Sindh Wildlife Ordinance, 1972 and only a person with a licence can keep the birds. The wildlife department at that time had stated that no permit for keeping pelicans in captivity had been issued since long. The donor, however, claimed that many of the birds were either donated by individuals who were finding it difficult to manage them or were born at his farm. Pelicans, according to wildlife experts, do not breed easily as people generally lack the basic knowledge of their management and failed to provide animals the right habitat. They are migratory birds and it has never been heard that a local resident population of the bird has developed at our lakes in the interior of Sindh. The zoo gets these birds from poachers. Only two baby pelicans were said to have survived at the zoo in two decades. The rosy pelicans (Pelecanus onocrotalus) also known as the great white pelican, the eastern white pelican or white pelican breeds from south-eastern Europe through Asia and in Africa in swamps and shallow lakes. The dalmatian pelican (Pelecanus crispus) breeds from south-eastern Europe to India and China in swamps and shallow lakes. This huge bird is the largest of the pelicans and one of the largest living bird species. The diet of both species of pelicans mainly consists of fish.